Association inauguration HORCRUX & guest Lecture on "startup and social innovations"
Mr.S.Ananth, Chief Executive Officer, Diverse Brains Life Solutions, LLP, Chennai. Dr.S.Sountharrajan, ASP/CSE, Bannari Amman Institute of Technology. Mr.A.Naveen Kumar, M.E Assistant Professor/CSE, Kavery Engineering college, Salem. 5/1/19 NPTEL Certification Awareness Programme is conducted by CSE at Thiruvallur Hall for students and faculty. EAC -2019 is conducted for three days 07.01.2019 to 09.01.2019 by CSE with 5 Entrepreneurs and Three government people from DIC, TIIC and Lead Bank. Mr. M. Chandrasekaran, Lead Bank District Divisional Manager, Erode addresses the gathering in EAC-2019 in III Session. Mr.P.S.Magesh, Officer, The Tamil nadu Industrial Investment Corporation addresses the gathering in EAC-2019 . Entrepreneurship Awareness Camp, organised by CSE Department is in progress. The Chief Guest Rtn.Rajaram, Proprietor, Volume Zero shared his wonderful entrepreuneal experience and amazing expertise with aspiring students. Mr.Sakthiprakash, Managing Director, Pluto-Nana Diary, Erode addresses the gathering in EAC-2019 Day 2, Session-1. Mr.Vijayakumar, Partner, Pluto Nano Diary interacts with Audience. Mr.Sundaravadhanan, Deputy Director, District Industries Centre, Erode under Department of Industries and Commerce delivers the IInd sesson on MSME in EAC-2019. Mr. Vijayakumar, Managing Partner, Pluto-Nana Diary Erode addresses the gathering in IIIrd session of Second Day in EAC-2019. CSE Department: Inauguration of value added course on "Java programming" by Chakrika Infosolutions, Pondicherry from 28.01.2019 to 04.02.2019. Excel Engineering College- Department of Computer Science Engineering is organizing "Hands-on Training in Cloud Foundation using VMware and Openstack" on 17th & 18th August 2018. Excel Engineering College- Department of Computer Science Engineering is organizing Guest Lecture on "Android App Development" on 25th July 2018. Excel Engineering College - Departments of CSE & IT is organizing for a psychological program on 18th July 2018 at Excel Campus. Excel Engineering College - Departments of CSE & IT has organized for an association inauguation program on 14th July 2018 at Excel Campus. Excel Engineering College, Excel College of Engineering & Technology, Excel Business School has organized Commencement of Bridge Courses for 2017-2018 Batch students of ECE, EEE, CSE, IT and MBA on 20th July 2017 at Excel Mini Auditorium A/C. 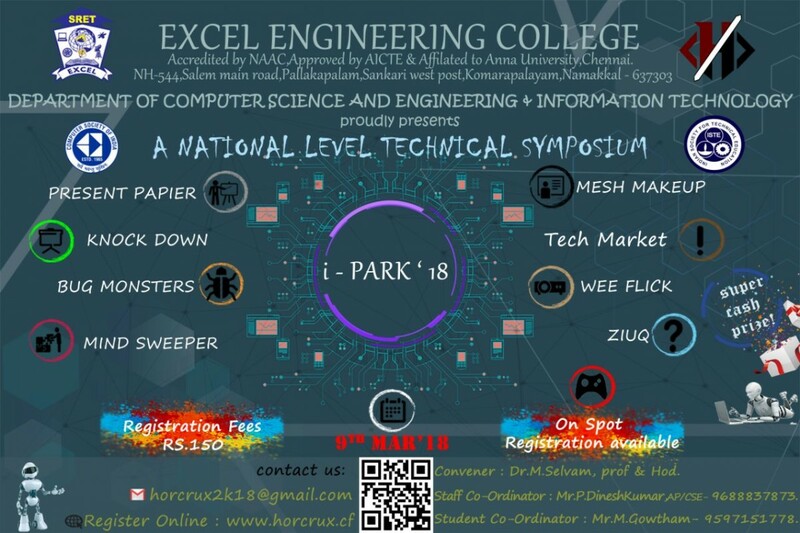 Excel Engineering College - Department of CSE has organized a "Industry Explorer"
Excel Engineering College - Department of CSE has organized a "Conference"
Excel Engineering College - Department of CSE has organized a "Guest lecture on AI"
Excel Engineering College - Department of CSE has organized a "Guest lecture on Software Platforms" on 15th March 2017 at Velappar Seminar hall,EBS Campus. Excel Engineering College - Department of CSE has organized a "Guest lecture on Career Building" on 4th March 2017 at APJ Seminar hall,Excel Campus. Excel Engineering College- Department of Computer Science Engineering Organized Workshop on Webminar Design of Consumer goods by Dassault Systems,Chennai. Peer to peer workshop on "PC HARDWARE ASSEMBLING" conducted on 24-01-2015.
app dhoom (Android Workshop) on 09.01.15. Faculty Development Program held on 08-01-2015 @ Excel Engineering College. Association Inauguration of Computer Science Engineering held on 01st August 2014. ASSOCIATION INNAGURATION (AMARPHENS 2K13) - 20/07/2013. FIVE DAYS TRAINING TO PANCHAYAT PRESIDENT AND PANCHAYAT SECRETARIES ON THE TOPIC OF "INFORMATION AND COMMUNICATION TECHNOLOGY" 18/11/2013 TO 22/11/2013 (5 DAYS). This course is all about the basic computer knowledge and usage of internet for the panchayat union people by our Excel Institutions. ASSOCIATION INNAGURATION (AMARPHENS 2K12) - 14/07/2012. NATIONAL LEVEL TECHNICAL SYMPOSIUM (Exzelon’12CSE) – 23/08/2012. Entrepreneurship Awareness Camp - 19/02/2012 to 27/02/2012. Association Inauguration Amarphens-2011 - 14/07/2012. National Level Technical Symposium- EXZELON’11 - 08/10/2011. Chief Guest address by Mr. Dinesh Kumar.A, Android Developer, Target Soft-Systems. •	CYBER SECURITY on 1.3.14. •	Java Programming on 22.2.14. •	Cryptography & Network Security	on 4.1.14. •	PROFESSIONAL ETHICS on 3.1.14. •	ROUTING PROTOCOLS on 12.10.13. •	RESEARCH OPPORTUNITIES IN SENSOR NETWORKS on 07.09.13. •	ORACLE- ALL IN ONE DATABASE on 17.08.13. Guest : Mr.S.KALIRAJ, ASSISTANT PROFESSOR, KONGUNADU ENGINEERING COLLEGE. CHIEF GUEST: MR.A.DHANAPAL , PROJECT LEAD, SURESOFT SYSTEM PVT.LTD, PONDICHERRY. CHIEF GUEST : PROF.MR.AASISH SINGH, VICE PRESIDENT SUTHERLAND GLOBAL SERVICES. Name of the Expert : Mr.C.R.Natarajan Retd Additional Chief Engineer,TANGEDCO. The Session is all about the the Business thoughts and statistical thinking for engineers. GUEST LECTURE ON PROBLEM SOLVING STRATEGY IN IT - 30-01-2013. Name of the Expert: Mr. Prasad Silveneka Founder & Chief/ADS SOFTTEK SECUNDRABAD. The chief guest quoted the major requirements from IT industry. Guest Lecture on WEB DEVELOPMENT TECHNIQUES - 02.03.2013. Name of the Experts: Selva Kumar.U Member Technical Staff, ZOHO Corp., Chennai. GUEST LECTURE -INDUSTRY EXPECTATIONS FROM FRESHERS – 20/10/2012 (FN). Name of the Expert : Mr.MAGESH SELVARAJ, ASSCT HR,EXCELACOM TECHNOLOGIES, CHENNAI. Seminar on “GREEN COMPUTING “- AN AWARENESS AMONG STUDENTS - 20-10-2012 (AN). Name of the Experts: Mr.A.Saravana Rajan M.C.A. CEO, Dhs Informatics Pvt Ltd,Bangalore Mr.Munna Kumar M.C.A Software Developer, Dhs Informatics Pvt Ltd, Bangalore. Guest : MR. BALAJI, DHS INFORMATICS PVT, LTD. Guest : MR. VASU, PRECISION INFORMATICS. Guest : MR.JAI SANKAR, PROCESS ANALYST,’IBM’, CHENNAI. CHIEF GUEST : MR.S.KARTHICK(M.D),‘S2I VECTOR’,ERODE. CHIEF GUEST : Mr.M.SIVAKUMAR M.C.A Excult Consultancy,Ashok Nagar,Chennai. CHIEF GUEST : Dr. R . KumarSr.Consultant,Wipro Technologies ,Chennai. Dr . N. ManoharanDirector-planning,Development∫ernational Relations,Anna university of technology , Madurai. Guest : MR.A.ZUBAIR RAHMAN PRINCIPAL AL-AMEEN ENGINEERING COLLEGE, MUTHUR. Guest : DR.S.MANAVALA SUNDERAM PROF/CSE VELLELAR COLLEGE OF ENGINEERING ERODE. Guest: MS.HEMASHRI HEAD/TECH, INDIAN INSTITUTE OF SOFTWARE TESTING. COIMBATORE. •	26-10-13,	WORKSHOP ON ”ANDROID”. Guest: J.SANTHANA KRISHNAN. COMMX SOLUTIONS, CHENNAI. Guest: MR.MAGESH SELVARAJ HR ASSOCIATE, EXCELACOM TECHNOLOGIES CHENNAI. Guest: MR.BASKAR SELVARAJ CEO, LINUXPERT SYSTEMS CHENNAI. Guest : DR.M.ARTHANARI, DEAN, NEHRU GROUP OF INSTITUTIONS, COIMBATORE. Guest : DR.R.SHRITHARAN PRINCIPAL, JKK MUNIRAJAH INSTITUTE OF TECHNOLOGY. Guest : DR.S.SENTHUR PANDIYAN PRINCIPAL, SNS COLLEGE OF TECHNOLOGY COIMBATORE. Guest : DR.P.KOUSALYA DEVI PROF / HEAD, DEPARTMENT OF COMPUTER SCIENCE AND ENGINEERING. PERUNDURAI. Guest : DR.S.SENTHUR PANDIYAN PRINCIPAL, SNS COLLEGE OF TECHNOLOGY, COIMBATORE. Guest : DR.S.SUGANTHI PROF/HEAD, DEPARTMENT OF COMPUTER SCIENCE AND ENGINEERING, HINDUSTAN ENGINEERING COLLEGE COIMBATORE. Guest : MRS. BATHUR NISHA ASSOCIATE PROFESSOR, JAWAHARLA INSTITUTE OF TECHNOLGY, COIMBATORE. Guest : MRS.MURUGA PRIYA.M ASSISTANT PROFESSOR SASURIE COLLEGE OF ENGINEERING PERUNDURAI. Guest : DR.M.THOLKAPPIARASU PRINCIPAL, AVS COLLEGE OF ENGINEERING SALEM. Guest : DR.V.KUMAR PROF/HEAD DEPARTMENT OF COMPUTER SCIENCE AND ENGINEERING. KNOWLEDGE INSTITUTE OF TECHNOLOGY MAGUDANCHAVADI. • 11.02.12,	MILNE’S AND ADAM’S PREDICTOR AND CORRECTOR METHODS. Guest : MR.G.SWAMINATHAN ASSISTANT PROFESSOR DEPARTMENT OF INFORMATION AND TECHNOLGY TEJA SHAKTHI INSTITUTE OF TECHNOLOGY, KARUMATHAMPATI. Guest : MS.V.LAKSHMI PRABHA ASSISTANT PROFESSOR DEPARTMENT OF INFORMATION AND TECHNOLGY TEJA SHAKTHI INSTITUTE OF TECHNOLOGY, KARUMATHAMPATI. Guest : DR.S.SARADHA PROF/HEAD DEPARTMENT OF COMPUTER SCIENCE AND ENGINEERING. IRTT. Guest : Dr.BALASARAVANAN DEPARTMENT OF COMPUTER SCIENCE AND ENGINEERING. SASURIE COLLEGE OF ENGINEERING PERUNDURAI. IV Year CSE Students went to Industrial visit at UST global, Bangalore on 17.8.17. IV Year CSE Students went to Industrial visit at Orange Software, Bangalore on 16.8.17. III Year CSE Students went to Industrial visit at Tecsacon, Bangalore on 18.8.17. III Year CSE Students went to Industrial visit at REI Electronics Ltd, Mysore on 19.8.17. II Year CSE Students went to Industrial visit at Techno Valley software India Pvt Ltd, Kochi on 24.8.17. III Year CSE Students went to Industrial visit at Indian Institute of Management, Kozhikode on 31.8.16. III Year CSE Students went to Industrial visit at UST GLOBAL SOLUTIONS, Cochin on 1.9.16. II Year CSE Students went to Industrial visit at Indian Institute of Management, Kozhikode on 12.8.16. II Year CSE Students went to Industrial visit at ISRO(VSSC), Trivandrum on 13.8.16. III Year CSE Students went to Industrial visit at Indian Institute of Management, Kozhikode on 30.7.2015. III Year CSE Students went to Industrial visit at UST Global Solutions, Tiruvanthapuram on 31.7.2015. IV – Year CSE Students Went to Industrial visit on Cranes software Solutions, Bangalore at 12.08.2015. IV – Year CSE Students Went to Industrial visit on ACIT PVT Ltd, Bangalore on 13.08.2015. III - Year CSE Students went to Industrial Visit to ACIT Plus, Bangalore on 28.08.14. III - Year CSE Students went to Industrial Visit to Mpower Global LTD, Bangalore on 29.08.14. IV - Year CSE Students went to Industrial Visit to Helios & Matheson North America Inc, Mysore on 07.03.14. III - Year CSE Students went to Industrial Visit to Thermal power Plant, Mettur on 05.03.14. II - Year CSE Students went to Industrial Visit to Infosoft Technology solutions, Coimbatore on 10.10.13. III - Year CSE Students went to Industrial Visit to Focuz Infotech, Cochin on 30.08.13. III - Year CSE Students went to Industrial Visit to Chips Software, Cochin on 31.08.13. II - Year CSE Students went to Industrial Visit to Dalmia Magnestic Corporation, Salem on 10.08.13. IV - Year CSE Students went to Industrial Visit to Aavin Milk Dairy, Chithode on 20.10.12. III - Year CSE Students went to Industrial Visit to Dalmia Magnestic Corporation, Salem on 07.09.12. II - Year CSE Students went to Industrial Visit to ICL, Sankari on 24.08.12. IV - Year CSE Students went to Industrial Visit to Poornam Infotech, Bangalore on 03.08.12.